Chers Amis: Pour votre information j'avais envoyé deux articles qui étaient sur le premier page du Globe and Mail hier et aujourd'hui. Ils sont res importantes pour votre journal. Merci John Steele Montreal March 7, 2016 Ottawa's plans to address rail safety under scrutiny By GRANT ROBERTSON Liberal government's budget plans examined following a Globe and Mail report that a 10-second procedure could have prevent the Lac-Mégantic rail tragedy The government's plans to address rail safety in the upcoming federal budget are coming under heightened scrutiny amid new revelations about the Lac-Mégantic rail disaster, which killed 47 people in 2013, but could have been prevented by a simple 10-second safety procedure. The Liberal government said after last fall's federal election that it plans to bolster rail safety in response to the Lac-Mégantic tragedy, in which a train loaded with highly volatile crude oil was left unattended and rolled down a hill into the Quebec town, where it exploded, killing dozens of people instantly. What prominence rail safety will get in the March 22 budget is uncertain. An internal communiqué sent to Transport Canada staff on Friday and obtained by The Globe and Mail indicates the department is bracing for cuts. The memo, titled Budget Planning for Next Fiscal Year, informs staff that "the budget situation is going to continue to be difficult for the year ahead," and recommends employees find ways to "work differently and better together." Within Transport Canada, a new board has been established "to review all staffing actions, and ensure they remain within the department's salary envelope," according to the memo, signed by deputy Minister of Transport Jean-François Tremblay. Staffing levels at the department were called into question after the Lac-Mégantic explosion, when a report by the Auditor-General of Canada raised alarms about Transport Canada's ability to enforce its own safety rules. Among the key concerns was a shortage of safety inspectors and auditors to catch rule violations by railways, and to ensure those companies were adhering to safety standards. The Globe and Mail reported on Monday1 that new information provided by an expert source inside the rail industry reveals the Lac-Mégantic disaster could have been prevented had the train operator used a 10-second safety procedure the night of the crash. Turning a lever inside the cab and activating the automatic air brakes on the train's more than 70 rail cars, coupled with the minimal number of handbrakes set that night, would have been enough to hold the train in place for at least a day, if not considerably longer. The train began to roll down a hill after the locomotive was shut off that night by fire crews extinguishing a blaze. Turning the engine off caused the air brakes on the locomotive to lose air, rendering them ineffective. The engineer set seven handbrakes, devices that are set by hand on a rail car, but they were not enough to hold the train. The automatic air brakes on the rail cars, which were not activated, are separate from the other brakes, taking much longer to lose air, and would have been a sufficient back-up to the hand brakes. The expert, who requested anonymity because he is employed in the sector, said the Lac-Mégantic train, with more than 70 rail cars, would have stayed in place until morning – and probably much longer – before some of the automatic brakes would release. In conjunction with the small number of handbrakes set, the two safety steps together would have held the train. The Transportation Safety Board's investigation into the disaster supports this idea, concluding that the use of the automatic brakes "would have acted as a temporary secondary defence, one that likely would have kept the train secured, even after the eventual release of the independent [locomotive] brakes." The report also points out that other railways, such as Canadian National, often use the automatic brakes as a back-up safety measure. However, Montreal Maine and Atlantic (MMA), the railway involved in the disaster, told its staff not to use the automatic brakes. Even though they take as little as 10 seconds to activate, it can take up to an hour to get the train moving again as the system recharges, depending on its length, the air temperature and other factors. Transport Canada is supposed to vet railways' operating procedures, meaning that MMA's instruction not to use the automatic brake as a back-up was listed in its operating manuals, yet raised no alarms. Auditors of MMA's manuals either did not notice notice it or saw no problem. At the release of its 2014 report into the disaster, then-TSB chair Wendy Tadros called MMA "a company with a weak safety culture ... where unsafe conditions and unsafe practices were allowed to continue. Which begs a question: Who, then, was in a position to check on this company ... to make sure safety standards were being met? Who was the guardian of public safety? That's the role of government; to provide checks and balances." The TSB's admission that the automatic brake "likely" would have prevented the accident if it was used as a secondary defence is on page 105 of the 179-page report and limited to a single paragraph. "This is another example of self-regulation gone amok," said Bruce Campbell, executive director of the Canadian Centre for Policy Alternatives, which has studied the regulatory problems that contributed to the Lac-Mégantic accident. The practice of letting railways write their own operating procedures under the Rail Safety Act that are then vetted by government auditors "has become a substitute for oversight," Mr. Campbell said. Transport Canada said on Monday the department employed about 100 inspectors and auditors at the time of the accident. Since then, that number has climbed to 137. "It is important to note that inspections and audits are only one element in the oversight system," Transport Canada spokeswoman Mélany Gauvin said. "The work of Transport Canada's inspectors is complimented by other experts, including researchers, engineers and other departmental officials who play a crucial role." The head of the union representing Transport Canada inspectors and auditors said 137 sounds higher than the reality, and was not sure how the department arrived at that number. However, Christine Collins, national president of the Union of Canadian Transportation Employees, acknowledged the number has risen in the past few years. Ms. Collins said MMA should not have been allowed to write its own safety procedures, particularly when carrying potentially explosive oil. "They should have never been allowed to do what they were allowed to do. They took shortcuts," Ms. Collins said. References 1.	www.theglobeandmail.com/news/national/new-info-shows-backup-brake-may-have-averted-lac-megantic-disaster/article29044518 March 7, 2016 New info shows backup brake may have averted Lac-Mégantic disaster By GRANT ROBERTSON A simple 10-second safety procedure that would have secured the train was not required by Transport Canada Nearly three years after the Lac-Mégantic rail disaster, new information shows the tragic explosion that killed 47 people could have been avoided by a simple 10-second safety procedure that Transport Canada did not require the cost-cutting railway to use. The revelation comes after the federal regulator issued revamped rail operating rules late last year, aimed at preventing another tragedy like the one that gutted the Quebec town in July, 2013, when a parked train loaded with highly volatile crude oil rolled down a hill and exploded, killing dozens of people instantly and decimating the downtown. In the new operating rules, Transport Canada requires that all trains left unattended – as the Lac-Mégantic train was on the night of the explosion – must be secured by a minimum number of hand brakes, which are brakes the crew sets manually on each rail car to hold it in place. The new rules also call for a backup method to be used for securing the train, and suggests the train's air brakes are one of the secondary defences that should be used. Contained in that suggestion is a nuance that has gone largely unnoticed until now, and has been glossed over in the official report into the Lac-Mégantic disaster. In addition to hand brakes, trains are equipped with two air-brake systems: the independent brake, which secures the locomotives, and the automatic brake, which holds the rail cars in place. The Transportation Safety Board's investigation into the derailment states that the failure of the locomotive air brake (the independent brake) on the night of the disaster was a key factor that led to the tragedy. However, on page 105 of the 179-page report, a single paragraph suggests the accident "likely" would have been avoided had the air brakes on the rail cars (the automatic brake) been set as a backup safety precaution before the train was left unattended. However, Montreal Maine and Atlantic Railway (MMA) instructed its staff not to use the automatic brakes. Transport Canada either didn't notice this practice or saw no problem with it. "While MMA instructions did not allow the automatic brakes to be set following a proper hand brake effectiveness test, doing so would have acted as a temporary secondary defence, one that likely would have kept the train secured, even after the eventual release of the independent brakes," the TSB said in its report. Setting the automatic brake takes only about 10 seconds, yet it would have been enough of a backup measure to hold the train in place long enough to prevent the disaster – and probably much longer, said one railway industry expert who spoke to The Globe and Mail. The expert, who is familiar with braking systems on trains, spoke on condition of anonymity because the person is employed in the sector. In order to set the brake, the locomotive engineer simply needs to move a lever in the cab from left to right, and in seconds the brake shoes are applied against the wheel of each rail car. However, because air needs to be pumped back into the brake line in order to reset the system and get the automatic brakes on each car to release, it can sometimes take from 15 minutes to an hour to get a train moving again once it's been parked. For this reason, some railways don't like using the automatic air brakes as an added assurance or backup to the hand brakes, because it can cost time and money, the rail industry expert said. The TSB determined that on the night of the explosion, the engineer didn't set enough hand brakes on each car to keep the train from rolling down a hill into Lac-Mégantic, where it derailed. While that fact is not in dispute, it is not clear why MMA was allowed to order its employees not to use the automatic brakes as a backup. Asked why the railway was able to issue such an instruction to its staff, Transport Canada told The Globe that its role is "to monitor railway companies for compliance with rules, regulations and standards through audits and safety inspections." However, the department added, "Transport Canada does not approve or enforce company instructions." Automatic brakes are by no means considered fail-safe, though they can be helpful. Edward Burkhardt, the chairman of MMA at the time of the disaster, said the brakes on rail cars also rely on air pressure within the brake cylinder to hold the train still. Over time, the air pressure in some of the brake cylinders can leak off and the automatic brakes will not work. How long it takes for that to happen, though, depends on a variety of factors, including how many cars the train is carrying. The more cars, the longer it takes for the automatic brake to stop working. "It's temporary. How long is temporary? That's subjective," Mr. Burkhardt said in an interview. "It could have been sufficient to hold the train there all night until the relief crew came on, in which case we would have had no such incident [at Lac-Mégantic]. But it might not have been, too. It might have meant that the accident occurred a few hours later than it did." However, the rail industry expert interviewed by The Globe said a train the length of the one that exploded in Lac-Mégantic, which was carrying upwards of 70 cars, would have been held in place for at least a day, or significantly longer, because most of the rail cars' brakes would not have released in that time, and there were seven hand brakes also holding the train in place. It is far-fetched to think the automatic brake wouldn't have played a direct role in preventing the accident, the person said. "This common sense, 10-second procedure has been used to secure rail cars for the last hundred years," the rail industry source said. The automatic brake is now considered an acceptable backup to hand brakes in the new operating rules issued in October. However, it is not clear why stricter rules requiring such backup measures weren't in place the night of the Lac-Mégantic disaster. The tragedy exposed how lax Canada's rail regulations were, with railways often permitted to write their own procedures that were not sufficiently audited by Transport Canada inspectors. In its report, the TSB cited "inadequate oversight" of railway operations as one of several contributing factors in the crash. However, asked why a simple safety procedure that could have prevented the disaster was buried deep in the report, and limited to a single paragraph, the TSB said it didn't want to distract from the main point that trains should be secured with the correct number of hand brakes. "We tried to steer away from any suggestion that air alone is sufficient to hold a train and instead to focus on more permanent solutions to train securement," said John Cottreau, spokesman for the TSB. "The TSB recognizes that an air brake application would have likely ensured that the train would have remained secured until the next morning, but it was not guaranteed." The TSB pointed to a derailment in 2011 in which a train operated by a regional railway rolled away while being held by an automatic brake. But in that case, the train consisted of older, malfunctioning cars with a unique design that weren't properly tested, making the situation difficult to compare. The TSB also says in its report that Canadian National Railway often uses the automatic brake as a standard backup method of securing its trains. Transport Canada also said hand brakes are the priority, but did not say why MMA was allowed to ignore the automatic brake – even though it was flagged by the TSB as something that likely could have saved the town. "Hand brakes are the first line of defence in preventing equipment from rolling away," Transport Canada spokeswoman Mélany Gauvin said. MMA, which declared bankruptcy after the derailment, had a reputation as one of the most aggressive cost-cutters in the rail industry, and had received unusual exemptions from Transport Canada, such as operating with a one-man crew, which allowed it to save money on labour. The revelation that shows MMA train operators were instructed not to use the backup air brake, even though it could have likely prevented the accident, comes at a time when the town is still suffering as it tries to recover from the disaster. A recent study released by public-health authorities indicates two-thirds of residents still suffer from "moderate to severe" post-traumatic stress from the deadly fires that destroyed the downtown, and some are now traumatized by daily events such as sunsets, slamming doors and the sight of trains. The accident has cost the federal government more than $155-million so far in funds that are being distributed to help the community rebuild. Bonjour! J'aimerais savoir si vous pouvez faire paraître une annonce pour une exposition de photos faites par la société d'histoire de Weedon pour le 17 janvier prochain. Si oui, pour quelle date je vs envoie une courte annonce et s'il y a des frais. Merci! J'attends votre réponse, Merci ! Bonjour, je me demande si nous pouvons vous faire parvenir un texte pour annoncer une activité au nom de la société d'histoire de Weedon pour le 17 janvier 2016 et sI oui vers quelle date que je dois vous le faire parvenir et s'il y a des frais, je vous remercie, Monique Gaudreau vice prés. 16 juillet, une journée à la mémoire d'Eugène Dostie. Le 16 juillet est le jour anniversaire de mon père Eugène. Il aurait 89 ans aujoud'hui. Il est parti pour un autre monde le 10 juillet 2002. Pour notre père et notre famille le mois de juillet est le mois de la fête, des rencontres familiales, des contes, du bonheur et de la nature dans toute sa rondeur. QU'aurait-il fait ou dit le matin du jour fatidique du 6 juillet 2013, cet évènement tragique, qui a boulversé notre été, notre bonheur et nos amitiés envolées. il aurait retroussé ses manches, posé l'épaule à la roue et serait allé de l'avant dans la construction de notre avenir. Il aurait dit, lâches pas Colette, prends soin de toi Maurice, Isabelle tu es notre avenir, tiens ton bout Gilles, marche Marcel pour témoigner de notre passé et de notre avenir. Il aurait pris Raymond dans ses bras et l'aurait serré très fort comprenant toute sa douleur, pour avoir perdu tragiquement deux de ses enfants. Ces gestes et ces mots il les aurait posés par amour pour Lac-Mégantic. Plusieurs fois il a refusé les avantages d'aller travailler ailleurs pour demeurer dans sa communauté. Membre de la direction des Industries Manufacturières Mégantic Inc., il y a travailé de 1950 à 1990. Il a engagé et aidé plusieurs personnes à y gagner un salaire, leurs études ou passer pour un meilleur emploi. Impliqué dans sa communauté il a été marguiller et membre du conseil d'administration de Desjardins à Fatima, conseiller et membre de l'exécutif de la commission scolaire, membre du comité de la relance des Industries Manufacturière Mégantic Inc. dans les années 1980. À ta douce mémoire, je te salue Eugène. Lorsque le gouvernement de madame Marois a demandé au gouvernement du Canada, tout comme l'a fait la Mairesse de Lac Mégantic, madame Roy-Laroche, de prendre leurs responsabilités et de faire appliquer des normes sécuritaires dans le transport de matières dangereuses, elle se fait accuser de chercher la chicane. Est-ce que c'est le type de discours que doivent entendre la population de Lac Mégantic, après avoir perdue 47 proches dans cette catastrophe sans nom. On n'aurait pas dû à avoir à demander l'application de normes strictes, sur une voie ferrée de compétence fédérale, les élus auraient du agir sans délais. Faudra-t-il se mettre à genoux pour que la vie soit respectée ? "ROUVERTURE" S'tu françà ça ? Je suis extrêmement déçu par la page couverture du journal du 20 décembre. J'aurais préférée de loin une image d'enfants joyeux jouant du djembé (Samajam) plutôt qu'un énorme train à quelques jours de Noël. J'ai su aujourd'hui que les gens des Milan ont eu un cadeau en tant que sinistre, une semaine paye a Lac Kenogamie. Je ne suis pas du tous d'accord de leurs avior donne ce cadeau car ils ne sont PAS sinistre. Lac Megantic devrais garder ces fonds pour les gens qui ont vraiement ete affecte et non donne des cadeaux de ce genre au familles avec de jeunes enfants (comme 2 4 ans) qui ne savent meme pas qu'est ce qui se passe qui ne sont PAS de Lac Megantic. Si tous les gens qui ont donne de l'argent pour aider les sinistres vennait qu'a savoir cela, je suis certaine qu'ils ne serait pas d'accord. On est dans une période où il y a beaucoup d'annonces dans les journaux, la télé, pour promouvoir les aliments du Québec. Achetez local permettrait à nos agriculteurs de s'en porter mieux et notre économie aussi. Même le magazine "Ricardo" en fait un numéro spécial ce mois-ci "Manger local". Alors, pouvez-vous me dire pourquoi, dans la seule épicerie qui reste à Mégantic, on retrouve des oeufs provenant des États-Unis??? Je trouve cela aberrant. Je crois que l'annonce est arrivée toute faite... Si elle passe la semaine prochaine, je verrai à faire la correction. Merci M. Campeau. Publicité pour La Boutik Électrik Une faute monumentale 2 semaines de suite : Maintenant relocalisER ???? Où est mon père? où est ma mère? Où est mon enfant? Sous les braises, aux portes du silence. J,ai tout perdu: des êtres chers, ma trame de vie. J'ai tant perdu sous les cendres. Je me sens seul et démuni. N'ai plus de repères, encore moins de rêves. Que des cauchemars dans la nuit noire, sans lune et sans étoile. Dans la suie et les cendres, est-ce toi ma mère? est-ce toi mon frère? Est-ce toi mon ami? est-ce toi mon unique enfant? Je me sens seul et démuni, comme si en un instant, la vie m'avait enseveli. Je sais que j'existe dans le souffle de vie, à l'orée du vent, dans l'envolée au soleil couchant, dans des bras accueillants. Je sais que le temps va passer et que jamais je n'oublierai. J'ai la certitude de te revoir à la porte des ailleurs. Et là, seulement à ce moment là, je pourrai t'étreindre, comme je ne l'ai jamais fait. Je t'enserrerai d'un amour infini et reprendrai avec toi le chemin de vie, le plus conscient, jusqu'à atteindre la profondeur de ton coeur en plongeant dans tes yeux de braises... Lucie-Soleil Ouellet, écrivaine. Nous pleurons avec vous meme si nous sommes loin de Lac Megantic. I would like to extend my heartfelt sympathies to the families and residents of Lac-Megantic during this time of loss. We cannot imagine what you are going through but want you to know our thoughts and prayers are with you. Article à lire. Burkhardt aime l'argent pas lesgens. Lac Megantic: Railway's history of cost-cutting A freight train derailment and explosion in Wisconsin in 1996 foreshadowed the Quebec inferno. Workers start to drain liquid propane out of derailed cars Saturday, March 9, 1996, in Weyauwega, Wis. Morry Gash/AP Photo Workers start to drain liquid propane out of derailed cars Saturday, March 9, 1996, in Weyauwega, Wis. By: Julian Sher Investigative News reporter, Published on Thu Jul 11 2013 Explore This Story 2 Photos 91 Comments Save to Mystar 1 Republish A freight train with dozens of cars carrying flammable material derails in a quiet rural community. Sixteen tankers jump the tracks and explode into flames. An entire town is evacuated. That was not Lac-Mégantic in 2013 but the town of Weyauwega, Wisc., in 1996. The founder and chief executive officer of the Wisconsin Central railway involved in the crash was Edward Burkhardt, the same CEO who runs the Montreal Maine and Atlantic Railway at the centre of the Quebec disaster. Burkhardt was named “Railroader of the Year” in 1999 by an industry magazine, but his cost-cutting measures over the years as he bought and sold railways and slashed staff have raised concerns from rail workers and safety experts. Photos View gallery Derailed train cars burn in Weyauwega, Wis., on March 4, 1996. zoom The Wisconsin blaze, caused by large amounts of propane and liquefied petroleum gas in the derailed train cars, burned for two weeks and it was “sheer luck” there were no deaths or injuries, said Jim Baehnman, assistant fire chief at the time. “We were concerned about a large explosion that would wreak havoc,” he told the Star in a phone interview. About 3,000 people in the community were evacuated for more than three weeks, he said. But he said the townspeople were grateful for the help and support they received from Burkhardt and his railway. More Lac-Mégantic: Lac-Mégantic engineer involved in earlier derailment The faces of the Lac-Mégantic disaster A faulty switch on the track was blamed for the derailment and the company eventually made payments to the town and some residents to settle lawsuits. The official inquiry by the American National Transportation Safety Board found that the “Wisconsin Central management did not ensure that the two employees responsible for inspecting the track structure were properly trained.” Just a year later, in November 1997, a handful of tanker cars carrying propane derailed in the Wisconsin town of Appleton, forcing the brief evacuation of 2,000 residents. Burkhardt dismissed the reaction as a “tempest in a teapot. “This was a very minor incident,” he told reporters. “There was never was any potential danger.” But at the time the local police department said the railroad “highly minimizes what was there.” “We’re not going to take a chance of people getting hurt of killed,” said police official Ray Reimann. Burkhardt sold Wisconsin Central to CN for $1.2 billion in 2001 and began accumulating other smaller rail companies around the world under his Chicago-based Rail World Inc., “specializing in privatizations and restructuring” according to its website. When he took over the Montreal, Maine & Atlantic Railway in 2003, he cut employee wages by 40 per cent according to a company history in the Bangor Daily News. There were more layoffs and cuts in expenditures in 2006 and again in 2008. The company also announced plans “to improve safety and efficiency” by cutting its locomotive crews in half, replacing two workers with a single employee. That prompted at least one veteran engineer to quit the company in part over his fears for safety. Jarod Briggs, who had worked on railways since 1998, told the Star he left MM&A in 2007 because he thought leaving only one engineer in charge of a train — as happened in Lac-Mégantic — was too risky. “If you have two people watching you can catch a mistake,” he said in a phone interview from his home in Maine. “It was all about cutting, cutting, cutting. It’s just an example of putting company profits ahead of public safety.” Briggs, who used to work on the company’s routes into Canada, said he was dismayed but not entirely surprised by the disaster in Lac Mégantic. Statistics from the American Federal Railroad Administration show that between 2003 and 2011, Burkhardt’s MM&A company had an accident rate more than double or triple the national average for the rail industry. Vendredi 14 décembre 2012. Bonjour et Joyeuses Fêtes à toute l'Équipe de L'écho de Frontenac. Merci de nous infomer, nous gens natifs de Lac-Mégantic et sa région et vivant à l'extérieur! Bon congé le moment venu! Merci! Sherbrooke, vendredi 7 septembre 2012. Demain samedi : Une heure pour la Terre 2012 est enfin à nos portes ! samedi 31 mars, de 20 h 30 à 21 h 30 (heure locale), assurez-vous d’éteindre vos lumières pour montrer votre appui à la lutte aux changements climatiques. Engagez-vous à participer à Une heure pour la Terre afin que nous puissions ajouter votre voix à des milliers d’autres personnes qui se soucient de la santé de notre planète. Une vigile commémorative aura lieu le 16 Février à 19:00 hrs à l'église de St-Romain suivie par une marche jusqu'au lieu de la tragédie afin de rendre hommage aux 3 disparues et retour à l'église pour un moment de recueillement collectif. Bienvenue à tous et toutes ! Avec le drame de St-Romain, les questions fusent de partout! Pourquoi ce Pascal était-il libre de circuler à sa guise? Pourquoi le système a dés-institutionnalisé les personnes avec des problèmes de santé mentale? Y a-t-il des ressources pour ces personnes, pour leur entourage? Pourquoi, pourquoi, pourquoi? La santé mentale, c'est beaucoup plus que la schizophrénie, ça englobe aussi la dépression, les deuils, les troubles bipolaires, ça touche les gens qui survivent à des suicides, etc... Dans notre belle région du Granit, nous avons la chance et le privilège d'avoir une ressource en santé mentale! L'Ensoleillée, Organisme communautaire en santé mentale dirigée par Linda Gendreau, que j'ai cotoyé pendant quelques annnées entant que membre du conseil d'administration. J'ai vu des campagnes de levée de fond s'y faire pendant plusieurs années et je sais que depuis quelques temps, il n'y en a plus, faute de temps. Nous savons tous que les besoins sont là alors si vous cherchez une bonne ''cause'' à laquelle donner! Que les chefs d'entreprises pensent que ce n'est pas parce que les demandes n'arrivent pas par la poste que les besoins sont moins présents!...Pour les familles, pour les personnes au prises avec des problèmes de santé mentale (et en passant, nous avons tous une santé mentale), pour que les intervenantes puissent continuer de travailler sans trop se préoccuper du côté monétaire et qu'elles puissent se concentrer sur le travail avec les usagers, avec les nombreuses personnes qui vont y chercher de l'aide, pour que plus de gens puissent y chercher des clefs!... Les ressources sont là, reste à les utiliser, reste à démystifier ce qu'est la santé mentale, reste à accepter d'aller chercher de l'aide, reste à savoir qu'on a besoin d'aide! Quand vous sentez que vous perdez le contrôle, quand le mal de vivre s'est installé, quand la peine semble trop forte, il y a un endroit tout près qui peut vous accueillir! Hélène Charron, propriétaire d'une santé mentale! Avec le drame de St-Romain, les questions fusent de partout! Pourquoi ce Pascal était-il libre de circuler à sa guise? Pourquoi le système a dés-institutionnalisé les personnes avec des problèmes de santé mentale? Y a-t-il des ressources pour ces personnes, pour leur entourage? Pourquoi, pourquoi, pourquoi? La santé mentale, c'est beaucoup plus que la schizophrénie, ça englobe aussi la dépression, les deuils, les troubles bipolaires, ça touche les gens qui survivent à des suicides, etc... Dans notre belle région du Granit, nous avons la chance et le privilège d'avoir une ressource en santé mentale! L'Ensoleillée, Organisme communautaire en santé mentale dirigée par Linda Gendreau, que j'ai côtoyé pendant quelques années entant que membre du conseil d'administration. J'ai vu des campagnes de levée de fond s'y faire pendant plusieurs années et je sais que depuis quelques temps, il n'y en a plus, faute de temps. Nous savons tous que les besoins sont là alors si vous cherchez une bonne ''cause'' à laquelle donner! Que les chefs d'entreprises pensent que ce n'est pas parce que les demandes n'arrivent pas par la poste que les besoins sont moins présents!...Pour les familles, pour les personnes au prises avec des problèmes de santé mentale (et en passant, nous avons tous une santé mentale), pour que les intervenantes puissent continuer de travailler sans trop se préoccuper du côté monétaire et qu'elles puissent se concentrer sur le travail avec les usagers, avec les nombreuses personnes qui vont y chercher de l'aide, pour que plus de gens puissent y chercher des clefs!... Les ressources sont là, reste à les utiliser, reste à démystifier ce qu'est la santé mentale, reste à accepter d'aller chercher de l'aide, reste à savoir qu'on a besoin d'aide! Quand vous sentez que vous perdez le contrôle, quand le mal de vivre s'est installé, quand la peine semble trop forte, il y a un endroit tout près qui peut vous accueillir! Hélène Charron, propriétaire d'une santé mentale! 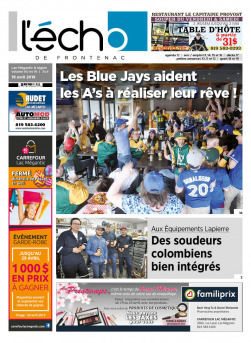 Les archives de l'Écho contiennent sûrement des références au club de Baseball de Lac-Mégantic. Il s'agirait pour vous de nous rendre à la bibliothèque municipale de Lac-Mégantic et d'aller regarder les microfilms de l'Écho de Frontenac dans les dates que vous désirez. Peut-être trouverez-vous ce que vous recherchez. Nous avons une visionneuse à nos bureaux mais nous n'avons pas d'imprimante. La bibliothèque offre ce service. Bonne chance ! Vos archives cintiennent-elles des r.f.rences au Club de baseball de Lac-Mégantic de 1950-51 ? Merci.c.p. Je voudrais garder mon annonce de pentre en bâtiment pour les mois de janvier, fév. et mars. Vous devrez change votre announce téléphonique et dire que vous êtes fermés pour la pérode de fêtes! Quoi de plus naturel à l'occasion de cette période de l'année pour souhaiter de Joyeuses Fêtes à toute l'Équipe de L'écho de Frontenac. Santé, bonheur, paix, amour, amitié, sécurité, défis et heureuses surprises tout au long de 2012! Bon congé le moment venu! Un lecteur assidu depuis 1970. Le C.A. de Stornoway refuse de payer pour le Centre sportif Mégantic ... Les citoyens sont furieux... même avec une pétition, la ville de Stornoway refuse de les écouter. Ça brasse à Stornoway. Le bon coté des averses d'hier: une invitation toute particulière de joindre le groupe 6 pieds SUR terre sur leur scène du kiosque du boul. des Vétérans . Spectacle chaleureux, présentant leurs pièces originales, par des musicien(ne) s et chanteurs(e)s de qualités. Avez-vous ressenti le tremblement de terre? Vous avez un beau format pour votre site web, mais il y a un hic! Quand on veut lire vos titre, la page saute continuellement dû au changement des photos accompagnants vos titres. Je trouve cela plutôt désagréable. Monsieur Moreau, il est possible de transférer votre abonnement papier en abonnement électronique. Désireux de réintégrer mon domicile de Frontenac, j,aimerais savoir s'il y a des opportunités d'emploi à votre journal pour un imprimeur pré-retraité ou presque.question comme ca. Samedi 21 mai | Place à la toupie de bois! La rencontre annuelle amicale pour jouer à la toupie de bois se déroule samedi 21 mai à 13h30 au Centre Mgr-Bonin. 18 mai | conférence Jardins d’ombre de fraîcheur par Cécile Allard, 19h00 au Pavillon de l’OTJ #megantic. Midi-conférence |Enjeu démographique: urgence d'agir! avec René Vézina, chroniqueur/blogueur ce midi 11 mai à salle C C à Lac-Mégantic. Ça y est: la vague orange a déferlé sur le Québec comme un tsunami! C’était pas du vent! Le Bloc glisse au 4e rang, derrière les conservateurs et les libéraux. Pour l’instant, le scénario de Projet démocratie semble se confirmer sur le terrain de Christian Paradis que le NPD a attaqué avec une candidate «poteau» dans l’espoir de le déloger, mais sans succès! Le Bloc et Pierre Turcotte sont relégués en 3e place derrière la candidate du NPD Cheryl Voisine tandis que le Parti libéral s’effondre en 4e place, loin derrière. Si la tendance se maintient... Christian Paradis se dirige vers une réélection dans Mégantic-L’Érable. Les conservateurs s’approchent d’une majorité au Canada, plus que 10; le NPD formera l’opposition officielle avec une possibilité de 90 sièges; les libéraux, possibilité de 29 et le Bloc, 3 en avance. Christian Paradis: 528; Cheryl Voisine: 360; Pierre Turcotte: 219; René Roy: 54; Parti Vert: 17. Maxime Bernier est réélu en Beauce. Notre tableau est plus lent ou quoi? Christian Paradis: 305; Cheryl Voisine: 218; Pierre Turcotte 127; René Roy: 36; Parti Vert: 10. Résultats fragmentaires: Christian Paradis: 271, Cheryl Voisine NPD: 190; Pierre Turcotte Bloc: 115; René Roy Lib. 34; Parti Vert: 9. Radio-Canada prévoit l’élection d’un gouvernement conservateur. Surpris? Premier résultat selon R-C: Christian Paradis 30 voix d’avance sur son adversaire bloquiste Pierre Turcotte. Bon; qui aura la première majorité après le dépouillement d’un premier bureau de votation dans Mégantic-L’Érable? À deux pas du local électoral de Christian Paradis. Les cloches vont-elles sonner bleu au clocher de la Chapelle? Les bureaux de votation viennent de fermer. Les retardataires devront attendre deux ans ou quatre ans avant la prochaine générale? Ca y est, le boulier devrait commencer à tourner. Twitterland est dans le brouillard sur New-Foundland. On parle maintenant de 5 libéraux et 2 NPD. Oups, «NE... lèvera pas haut ce soir! Petite fote de frança! À Enrich et Éric: si la tendance se maintient, y’a pas juste les conservateurs pour qui l’érection générale me lèvera pas haut ce soir! On verra ben, dans 9 mois! Drôle de campagne (c'est ma 8e). Des candidats uniligue anglo au Québec pour certains partis. Des députés qui ont la chienne de ne pas se faire élir. Une fin à la Hitchcock? On va voir! Selon Steven Guilbeault, le taux de participation dans certaines circonscriptions du Québec serait très élevé. L’appui au NPD, dit-il, viendrait des préoccupations environnementales, d’habitude défendues par les Verts. Antagonist sur Twitter: «On sait maintenant pourquoi les députés du Bloc ont fait de la caisse d’assurance-chômage une priorité. Ils vont en avoir besoin demain!» Ça sent un partisan conservateur, ça! Sur Twitter, des James Bond tentent de faire connaître des résultats électoraux en se servant de codes. «Deux cormorans rouges se sont envolés dans un ciel bleu. Je répète. Deux cormorans rouges se sont envolés dans un ciel bleu!» Quelque part à Terre-Neuve! À l’ère des médias sociaux, en admettant qu’aucun Canadien ne contrevienne à la Loi, rien n’empêche un Américain à Coburn Gore, un Français ou un Chinois de diffuser les premiers résultats électoraux. Petite planète! Les internautes respecteront-ils l’embargo? Selon Élections Canada, il faudra attendre que le dernier bulletin soit déposé dans l'urne avant que les Canadiens puissent discuter des premiers résultats électoraux sur Twitter ou Facebook. Lorsque les premiers bureaux de vote ont fermé dans les Provinces atlantiques, il restait trois heures aux électeurs de la Colombie-Britannique pour faire leur choix. Le Bloc a des budgets de publicité plus généreux qu’en 2008. Les amateurs de hockey ont pu le constater dimanche soir, en suivant les séries sur RDS. Des messages du candidat Pierre Turcotte ont été diffusés à quelques reprises pendant que le très francophone Lightning de Tampa Bay et son capitaine Vincent Lecavalier enregistraient une deuxième victoire sur les Capitals de Washington. Le «poteau» néo-démocrate viendrait de l’ Ontario, selon des femmes qui cherchaient à la rejoindre pour connaître son programme dans le comté. En désespoir de cause, elles ont déposé une plainte au bureau du NPD au Québec. Quelques devinettes proposées par une lectrice: «Stephen Harper pointera-t-il au chômage demain? Michael Ignatief restera-t-il encore longtemps le chef du Parti libéra? Jack Layton déménagera-t-il à Stornoway? (La résidence officielle du chef de l’ Opposition et non la municipalité de la MRC du Granit) Et Gilles Duceppe aura-t-il envie de rapatrier ses troupes au Québec pour la prochaine campagne provinciale? Quelques réponses en fin de soirée! Parlant de la candidate néo-démocrate, celle-ci n’ a pas tweeté de message sur son compte depuis le 13 avril. L’ ensemble des messages sur son compte twitter se lit en anglais seulement. Les candidats du Bloc, du Parti libéral et du Parti conservateur dans Mégantic-L’ Érable s? entendent sur un point: le NPD et sa candidate dans Mégantic-L’ Érable, Cheryl Voisine, ont manqué de respect pour les électeurs. «En présentant des candidats qui ne parlent pas français et qui ne se sont jamais présentés dans le comté où ils veulent se faire élire, le NPD démontre à quel point il est déconnecté des régions du Québec. C’ est un manque de respect et de professionnalisme flagrant», a résumé le conservateur Christian Paradis. Alain Bergeron de l’ Action canadienne a même indiqué pour qui il accordait son vote. Encensant le travail réalisé par le député sortant Christian Paradis dans son comté, estimant que «les efforts et l’ implication de René Roy (candidat du Parti libéral du Canada) méritent également reconnaissance», considérant que «le mandat du Bloc québécois à Ottawa tire à sa fin» et qu’ il ne pouvait pas voter pour une personna absente du comté (lire la néo-démocrate Cheryl Voisine), devinez pour qui il déclare avoir voté... «J’ ai décidé de choisir un gars de la région et j’ ai voté... Pierre Turcotte (Bloc).» En ligne droite avec sa «vision d’ un nouveau Canada à bâtir»? Bizarre cette campagne! En ce jour d’élection générale, l’Écho se met en mode web dès 19h00 pour recueillir vos commentaires sur la récente campagne, via le site EchodeFrontenac.com. Comme les bureaux de votation fermeront à 21h30, les premiers résultats du dépouillement du scrutin, via Élections Canada, pourraient nous parvenir vers 21h50. Ce qui ne vous empêchera pas de partager vos commentaires, via notre blogue et les réseaux sociaux. Bonne soirée !